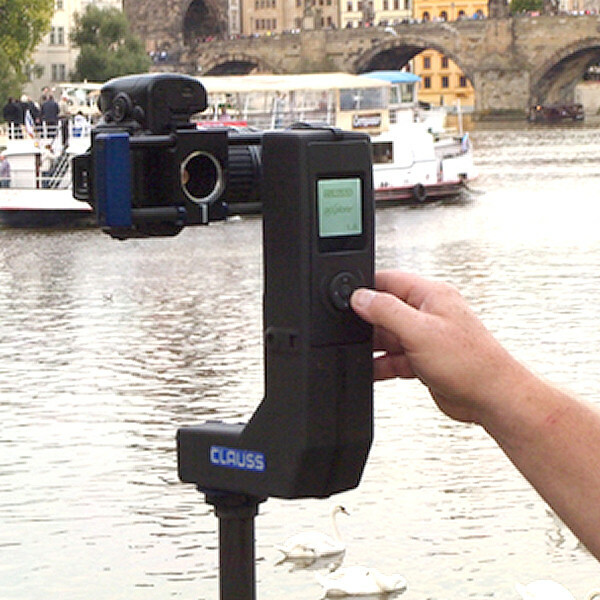 The RODEON piX Series are the top-level products worldwide for taking spherical 360° panoramas. With the fully automatic pan-tilt heads, the RODEON piX Series creates not only cylindrical panoramas, but also spherical 360° x 180° HDR panoramas for a productive workflow! 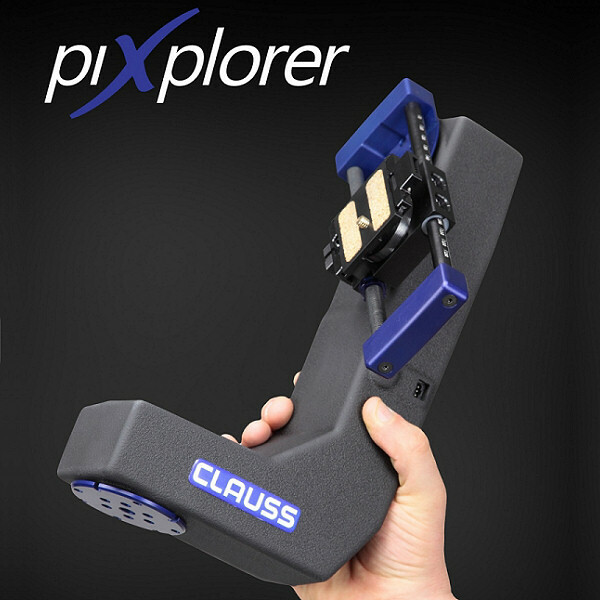 With ease, you succeed in creating gigapixel panoramic images with high quality results and precision. Manual control in the recording process, exact nodal point adjustment as well as many other innovative features are included. AVAILABLE NOW! 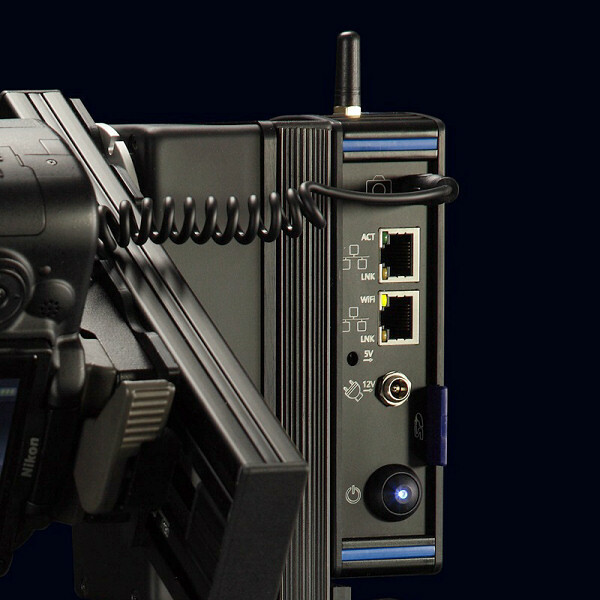 All our new panoramic heads are now being equipped with a WLAN (802.11b/g/n) Transceiver - completely independent from any platform or device, and compatible with any operating system. If the use of WLAN operation is not allowed or a problem, you can easily switch and use a standard LAN cable connection. We are raising again the standards of our panoramic heads to an even higher level and allow the connection to the panoramic heads to be controlled using any browser-enabled device and thus, a completely platform-independent! Never before had the control of a panoramic head been that easy - it's just like visiting your favorite website. 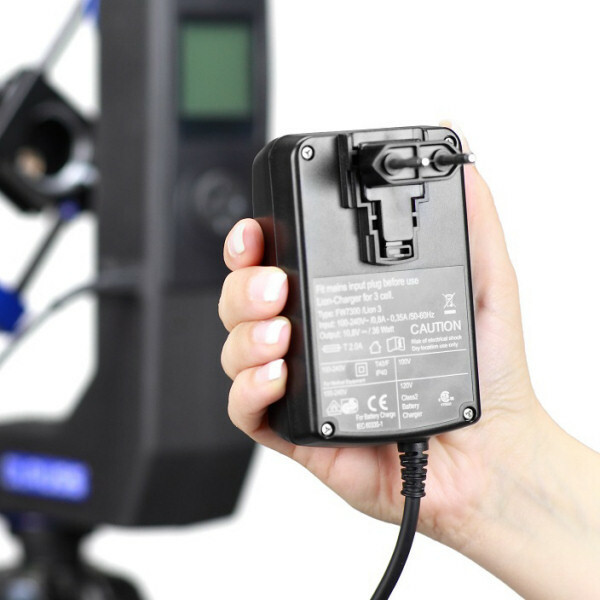 The control of the panoramic head can be done with your preferred operating unit - whether smartphone, tablet, laptop or PC running any operating system (Windows, Windows RT, Mac OS X, Chromium OS, Unix, Linux, Android, iOS, Windows Phone OS, Blackberry, etc). As long as it has an installed browser, there are no limitations. Switching to any kind of control unit is no longer a big deal. Every DSLR digital camera (e.g. Canon, Nikon, Panasonic, Mamiya, Sony, Olympus, Lieca, etc.) becomes a panorama machine in connection with any one of the RODEON piX Series. Use all features of your modern digital camera, your high-quality lenses and your well-proven color-management-system for wide-angle and panoramic photos. 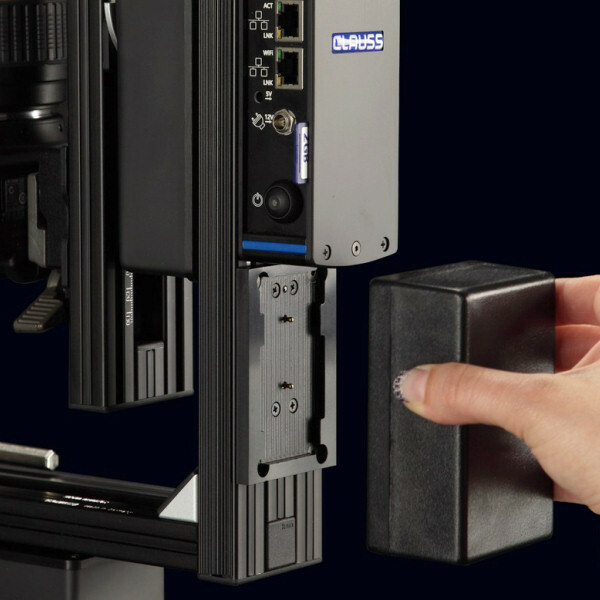 The RODEON piX Series scans the selected panoramic view fast and precise by moving the camera around it's nodal point verticaly and horizontaly. The vicinity is scanned, fully automated by triggering the camera at precise points. Single step adjustments are no longer required. No artifacts resulting from line-scanning. No shaking while capturing HDR images. It's just a simple nodal point adapter! All models of the RODEON piX Series are well suited on their manifold fields of operation. The movement is free, configurable and controlled wirelessly via WLAN (802.11b/g/n) with a fully browser-based application. 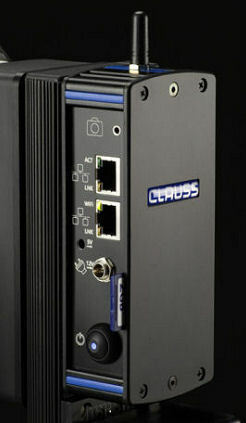 It can also be controlled via LAN for wired connections. For special applications, custom scripts can be programmed. Every individual settings can be saved and loaded as profiles every time. 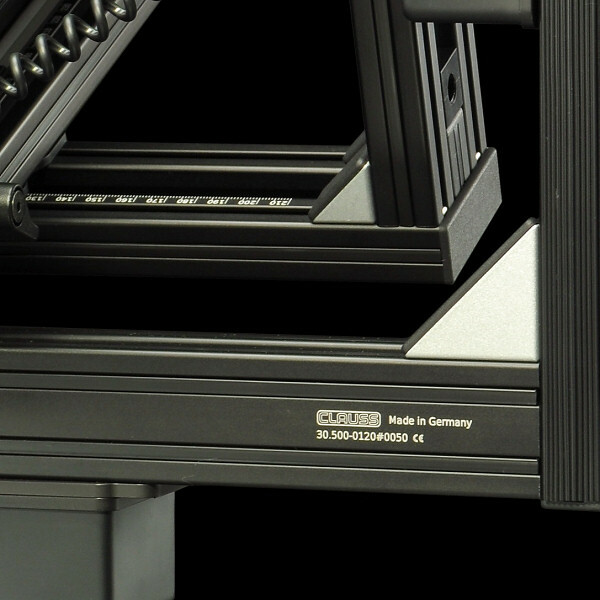 RODEON piX Series is based on a common modular construction system. 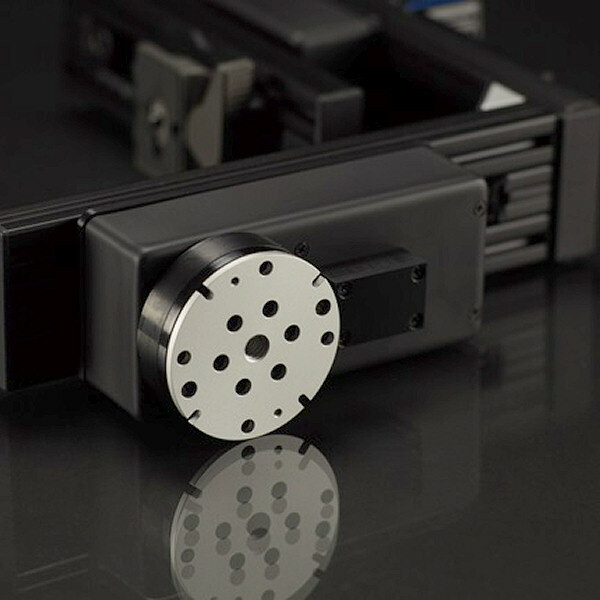 Due to its consistent mechanical and electronic modular design, your investment is protected. All modules can be easily assembled and modified. RODEON piX Series is always up-to-date, even if you want to buy a new camera. No matter how modern and high-resolution it is: RODEON piX Series grows continously with it. RODEON piX Series does not require a long setup time: set it up with your tripod, fasten your camera with the quick release adapter and just start it! 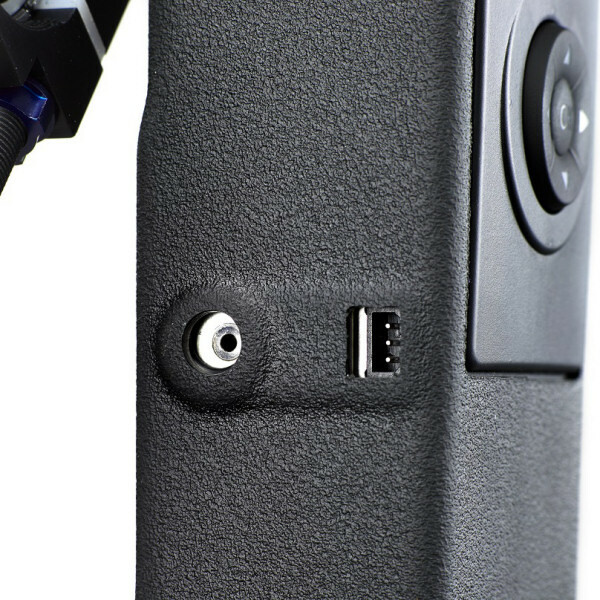 Our new RODEON piXposer replaces the RODEON VR Head HD and elevates itself into new heights of technical precision. 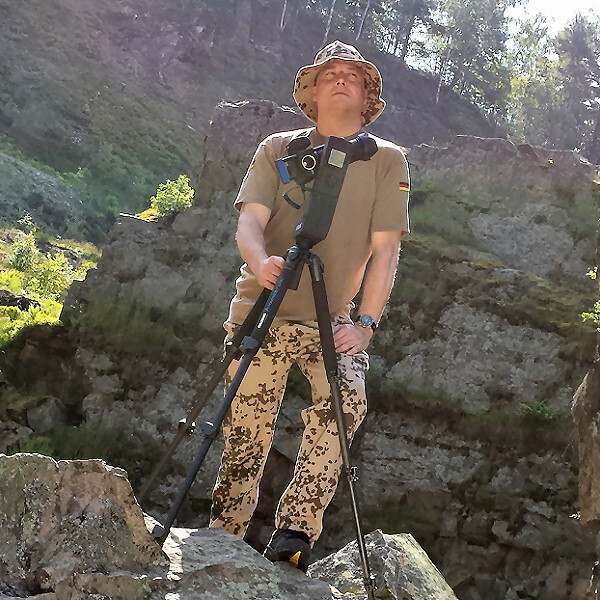 Do you create reproductions and photographs with ease in the three-digit gigapixel range? 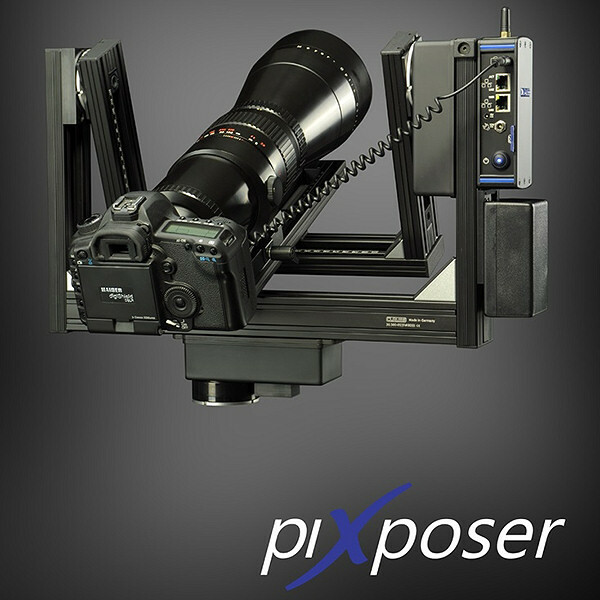 The RODEON piXposer is the flagship of the Rodeon piX Series, and worldwide "State of the Art" in the field of gigapixel photography. 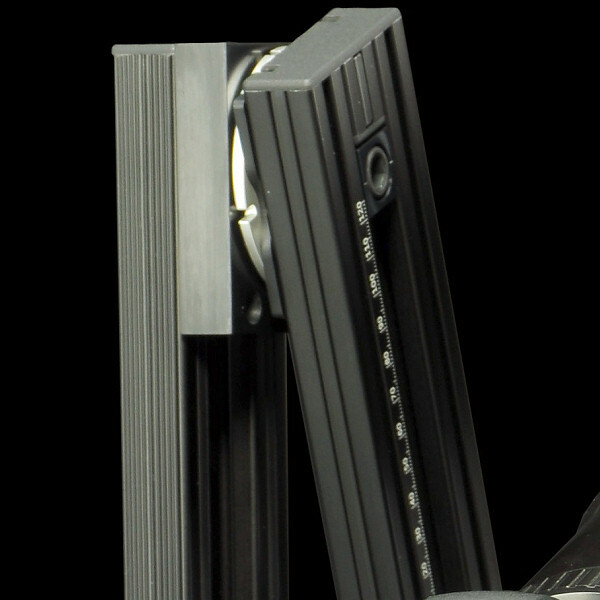 This fully automatic pan-tilt head sets itself apart from other models by its enormous rigidity and payload because of the "Double-U" construction. 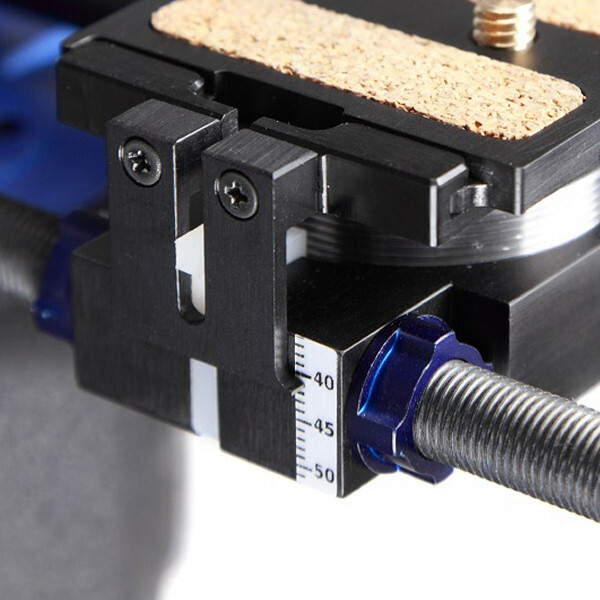 This feature, paired with the high precision and strength of the gears, as well as the magnetic brake at it's base plate, are the best combination for extreme high resolutions in the range of gigapixel imaging for use with long focal length telephoto lenses and heavy photographic equipment. 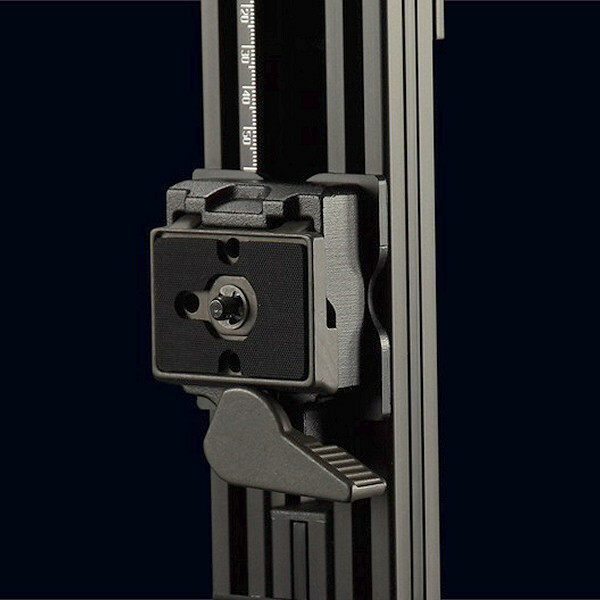 Designed and manufactured for meeting highest requirements regarding stability, strength, and precision in photography and movies. 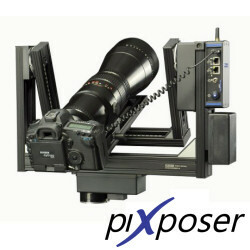 Use your premium photo or film equipment together with the RODEON piXposer! This combination allows you to create technically perfect panoramic images and video pans in a quick and clean workflow, even under difficult conditions. Controlling software included. 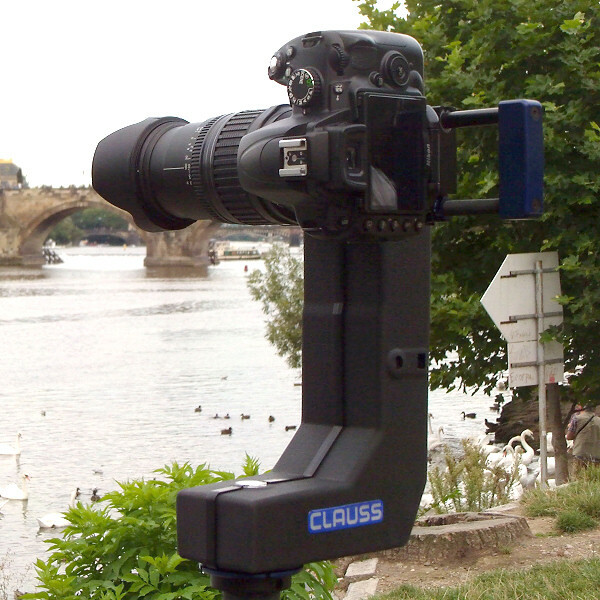 With the heavy-duty gears, the RODEON piXposer can be positioned precisely without shaking, and then a 360° x 180° panorama of the highest detail is captured. 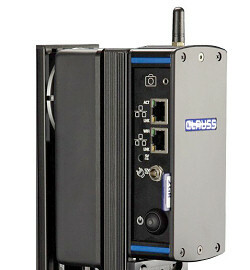 It paves the way for shooting HDR images or high-resolution reproductions up to three-digit gigapixel resolution range. It's new WLAN 802.11b/g/n feature - our world first - allows for wireless and operating system independent control, the requirement for a high degree of professionalism. You can use any of your favorite operating system whether (Windows, Windows RT, Mac OS X, Chromium OS, Unix, Linux, Android, iOS, Windows Phone OS, Blackberry, etc... as long as a web browser is installed on the device, nothing can prevent you from controlling the RODEON piXposer. With this technical development, the operation is a minor matter - you can fully concentrate on the creation of your masterpiece. Even the most diverse operating units are individually interchangeable within a very short time... you can easily switch back and forth between smartphone, tablet, laptop or PC in a snap - like a visit to your favorite website. Should specific requirements of the environment in your situation not permit the use of WLAN, a change to the LAN connection cable is possible at any time. It is also controlled by the high level of professionalism - Do not be a slave to technology! The user settings made during the panoramic shoot can now no be safely stored on the device itself through the built-in SD Card interface: the RODEON piXposer settings can be transferred as user profile quickly and easily, accessed in the control panel or be stored on the memory card making processing of records fast and simple. It's even simpler: with the RODEONpreview software, you can also preview immediately the full panorama during the capture process. 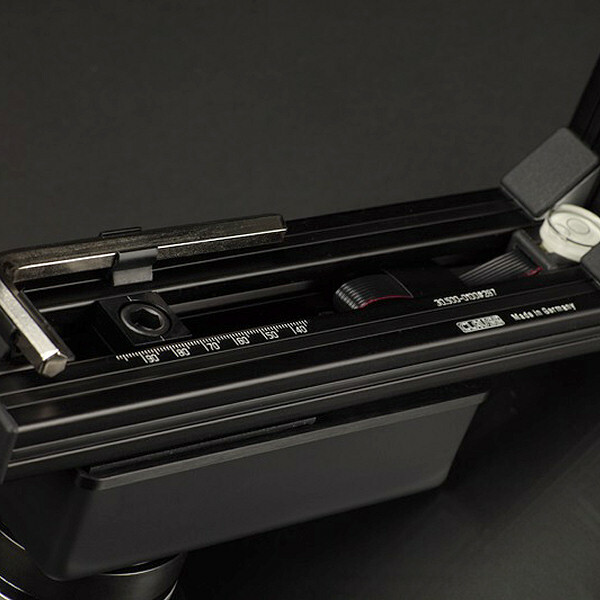 True to the motto "Never change a winning team" - of course, you can use your best professional photographic equipment - the RODEON piXposer is compatible with almost all DSLR and medium format cameras. Gigapixel photography techniques differs from common panoramic techniques especially since the equipment that has to be moved is heavier, that is, the rotary difference between two captured frames is much smaller and the requirements on stability between one image capture to the next is critical because of the smaller field of view. For these special requirements, the RODEON piXposer has been designed and has risen to international "State of the Art" standards. Typically, for wide-angle and panoramic images, standard camera exposure settings are used. However, the use of HDR (high dynamic range) techniques have become popular where complete exposure bracketing is done at every camera position. The great stability of the RODEON piXposer during the whole exposure bracketing offers the best means for utilizing HDR techniques, even at highest zoom levels. Projection flashbulbs can be mounted on the RODEON piXposer frame as well that follow the pan-tilt-movement synchronously with the camera. Because of that, the RODEON piXposer is a real and much cheaper (!) alternative to large-scale scanners, which has already been proven by some of our costumers with spectacular projects. 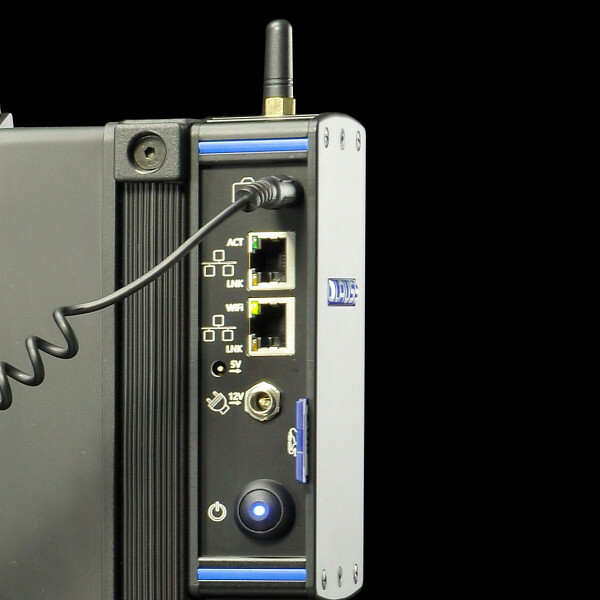 All systems include the RODEONmodular browser-based controlling software via WLAN (802.11b/g/n) or LAN (RJ-45). The RODEONpreview 2.x PRO (Windows only) is available as an optional software. With this full-featured software, aside from controlling the head, more functions are available providing support, planning and the realization of your project. The purpose of RODEONpreview is to let the user work faster, more comfortably and more secure by getting an impression of the whole panorama image instantly after its capture and by correcting it selectively if needed. 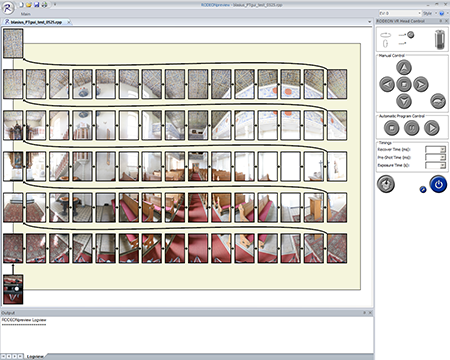 The software RODEONpreview treats every panorama prior to its capturing as a single unique project. Within that project all parameters regarding the recording, deliberately made settings, META information, and not to forget the name of every single image file are stored. For a better handling a separate directory is been created for every project, which gets the same name as the project itself, and which contains all relevant files like the project file, the original image files as well as any exported data. 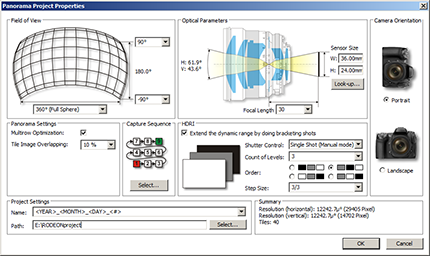 The user has the ability to control a connected RODEON VR Head directly out of RODEONpreview, and to get the captured images instantly displayed within the software. The functions are optimized to allow a fast and straight-forward examination of all captured image data and to easily get connected to any third-party software product. Additional features like a comprehensive database of camera models, assist the professional user at his daily work. The setup of all necessary capturing parameters has been designed intuitively, and therefore prevents mistakes. File operations with single image files has become completely obsolete because a project has been accounted and handled as one coherent entity. The supported image file formats are not limited, and can be extended at any time by simply installing additional codecs. Support for JPEG, TIFF, PNG, BMP, GIF and WMF is already built in. RAW-Codecs are provided by other manufacturers by Canon and Nikon for free. 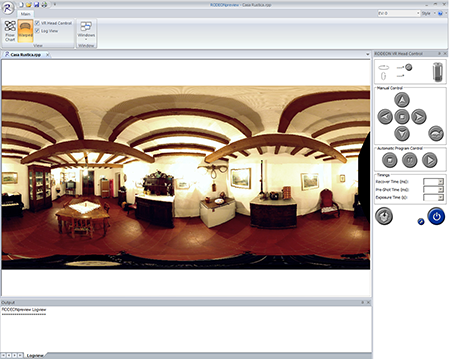 Thanks to the integrated instant preview, the whole panorama can be seen and evaluated already while it's being recorded. In worst cases, the user is able to reject one or more single images and to re-record them selectively. RODEONpreview has been optimized on speed at loading as well as displaying images. High level parallelization does optimally take in account all available processor units, an intelligent memory management keeps the usage of resources low to let other programs run fluently, and the embedded preview images reduce the time needed for opening an existing project file considerably. 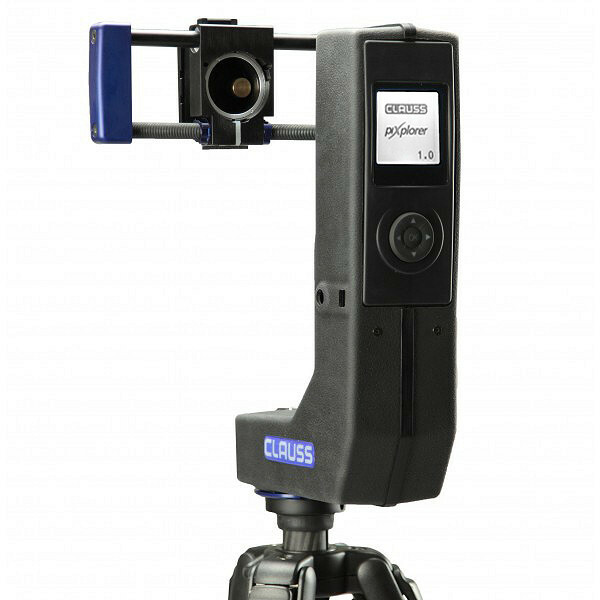 Our new RODEON piXpert replaces the RODEON VR Head ST and is your ideal partner for virtual tours or high-image panoramas. Do you want zoomable panoramas with boundless wealth of detail? 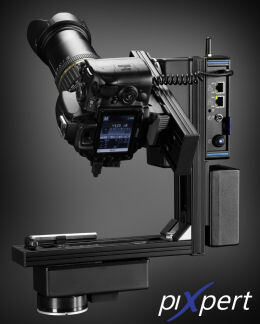 The RODEON piXpert is a fully automatic pan-tilt head in combination with high-level technology. 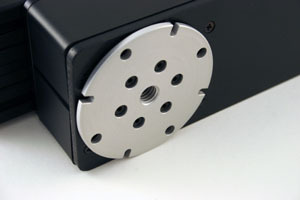 The RODEON piXpert is a flexible system for many applications. With its compact construction form and powerful gears, this head can move even longer lenses securely and with highest accuracy. The RODEON piXpert is a workhorse. 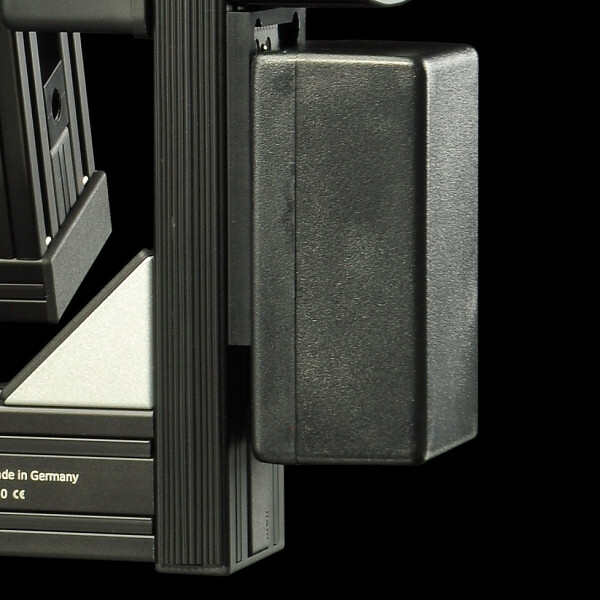 It is designed to move and position heavy DSLR telephoto lenses (<500mm) safely and with pinpoint accuracy. The combination of a strong horizontal drive with magnetic brake to stop securely at every position and an even more powerful vertical drive moves all loads reliably and with precision. It ensures for a fixed, blur-free capture. 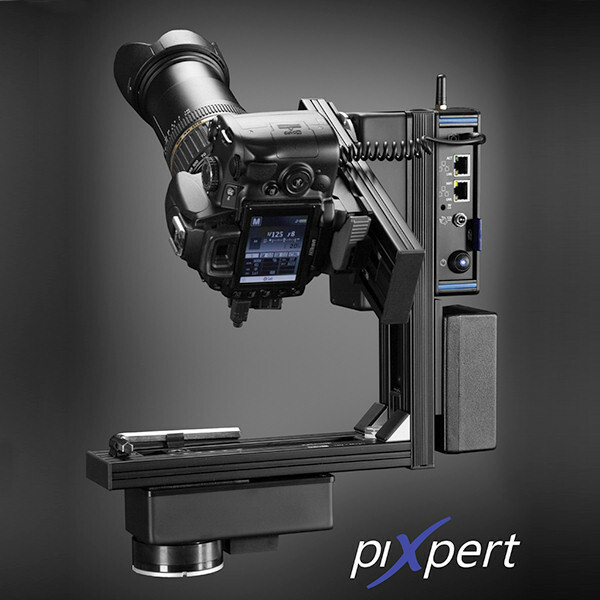 Use your professional photo equipment together with the RODEON piXpert for creating panoramic images with high-quality standard. 180° inclinations in conjunction with 360° rotations easily create spherical panoramas of impressive quality. The worldwide standard - WLAN 802.11b/g/n feature - allows wireless and operating system independent operation with a high degree of professionalism. No matter what operating system your operating device is using - Windows, Windows RT, Mac OS X, Chromium OS, Unix, Linux, Android, iOS, Windows Phone OS, Blackberry, etc... as long as a web browser is present, nothing stands in the way of the controlling the RODEON piXpert. Even a quick change of the control unit is easily possible ... nothing is required to be installed on the device. The operation is a breeze as if you were to connect to your favorite website. Should specific requirements of the environment in your situation not permit the use of WLAN, a change to the LAN connection cable is possible at any time. The user settings made during the panoramic shoot can now no be safely stored on the device itself through the built-in SD Card interface: the RODEON piXpert settings can be transferred as user profile quickly and easily, accessed in the control panel or be stored on the memory card making processing of records fast and simple. It's even simpler: with the RODEONpreview software, you can preview immediately the full panorama during the capture process. You already have a professional photo equipment? Perfect! 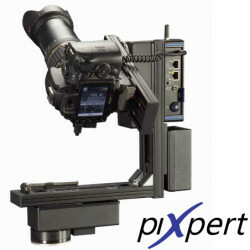 The RODEON piXpert is compatible with almost all DSLR and medium format cameras. The RODEON VR Head CL has been completely redesigned - the panoramic head now has a new look and under the name RODEON piXplorer! 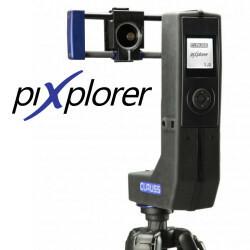 Our new RODEON piXplorer will complete our range of panoramic heads and will raise it to a new level. With smaller weight and measurement but still at a low budget, we are able to keep the quality standards of all our panoramic heads. We have gained from our experience of the past years and created a complete new product. Are you an explorer, always on the move, on the lookout for the next amazing adventure or experience? The RODEON piXplorer is your perfect companion! The fully automated panoramic head completes our RODEON family and still equals its older brothers with its quality and power. With its small dimensions, it easily fits in every backpack - you won't want to miss it on your next getaway. 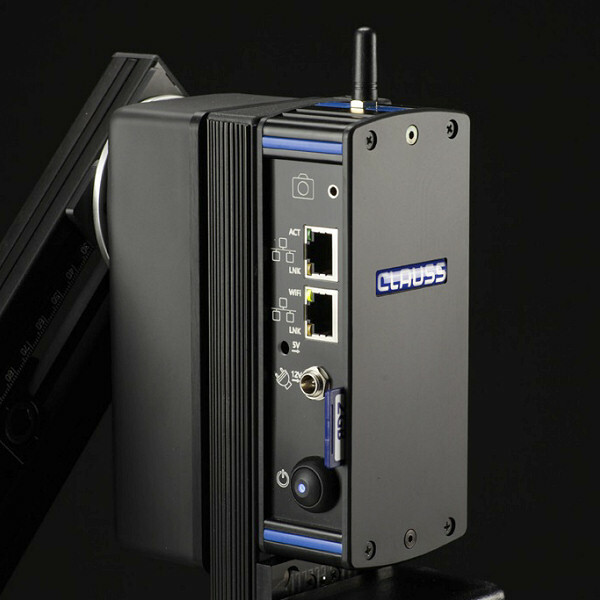 The combination of the strong horizontal and vertical gears with the integrated control panel makes it easy to create beautiful 180° x 360° panoramas. Our engineers have been influenced by our customers urge for adventures and have done everything to perfectly prepare the RODEON piXplorer for use outdoors. It is protected against dust and humidity in accordance to IP54 standards. The rechargeable power pack is now integrated in the housing which allows use even on bad weather days. If necessary, a charger can be plugged into an appropiate socket. The outer shell of the RODEON piXplorer is now furnished with a non-slip rubberized coat so that you can always keep it steady and safe during handling and transport. 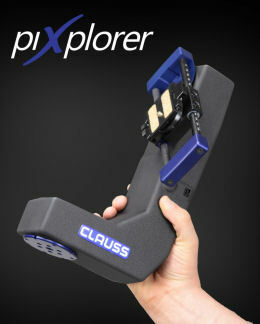 Additionally, our technicians developed a new quick-release-system and equipped the RODEON piXplorer with an unique super-flat quick-release-adapter. All suitable DSLR-Cameras up to an axial height of 52 mm are compatible and applicable, with just one click, to the device. 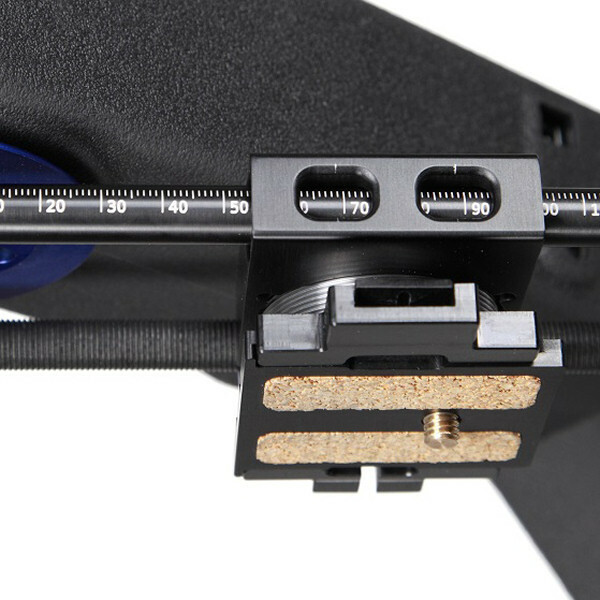 An additional adapter plate enables double stabilization of the camera and prevents a slipping during the recording. The adjustment of the nodal point is simple and fast to do. Operating the RODEON piXplorer has never been this easy: the user profiles are stored internally, downloading the images is done via the storage card of the camera, and the postprcessing is done with the free software RODEONpreview LITE. We have designed the control of the RODEON piXplorer in a way that allows an easy and quick operation through several tabs which can be directly controlled via the control panel on the device itself. You no longer need any additional accessories whilst you are on your adventure trips - the RODEON piXplorer is always ready to go! You know the problems of stitching after the panorama recording? Don't worry anymore - the RODEON piXplorer helps you! The extreme high precision and the free software RODEONpreview LITE guarantees an automatic workflow with clean results - even under bad conditions. Fast like a twister is the integrated Twister-Mode - record large views sharp and without ghosting. The Twister-Mode saves a lot of time for retouching and brings life into your images. It does not matter if it's day or night, the jungle or the highest mountains in the world - the RODEON piXplorer fullfills evey task. The Twister-Mode is fast like a whirlwind, but the RODEON piXplorer also could be slowed down for Time-Lapse-Movies. As of now, no view is to big for a photo, thanks the Brenizer Method. And if it is cold outside, you don't have to take of your gloves to control the panoramic head. The HDR panorama - no problem! 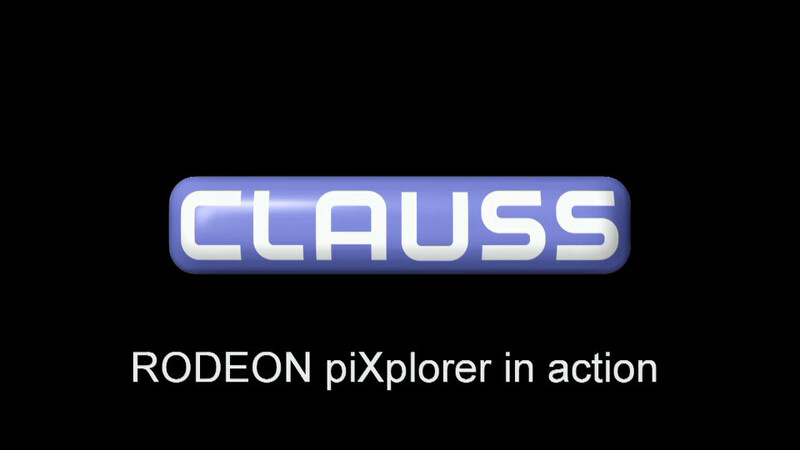 The RODEON piXplorer has the solution. Switch to HDR and forget your worries about limited dynamic and faulty exposures. Grey-in-grey is too few for you? Bring life into your point cloud and combine your RODEON piXplorer with a lot of laser scanners - of course, among others the RODEONsmartscan. Panorama recording has never been easier! 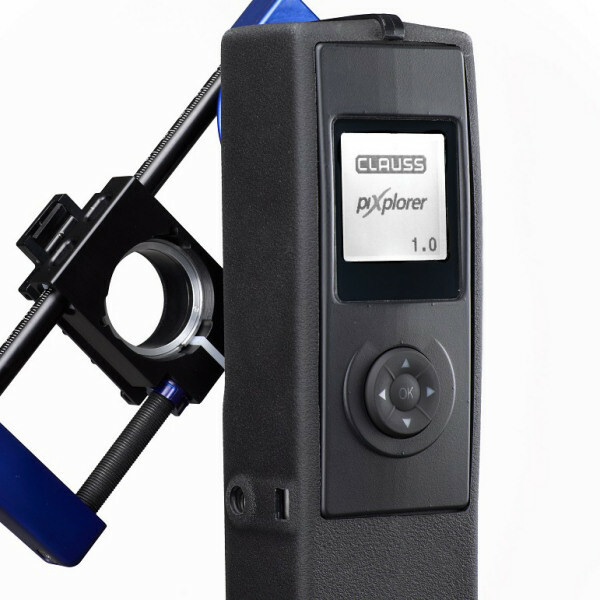 With its very low cost, the RODEON piXplorer is perfectly suited for users with a small budget. Newbies have a new way to create wonderful and professional 180° x 360° panoramas with a device of high quality standards at an affordable price. Dust protected - Ingress of dust is not entirely prevented, but it must not enter in sufficient quantity to interfere with the satisfactory operation of the equipment; complete protection against contact (dust proof). Splashing of water - Water splashing against the enclosure from any direction shall have no harmful effect. Individually tested and calibrated, each device is mounted, adjusted and checked. 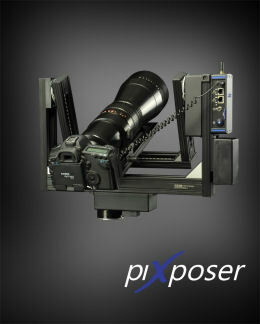 *The RODEON piXpert and piXposer can be customized and engineered for any kind of installation and application. They can be fully controlled remotely at ANY distance - even beyond 100m. Contact us with your requirements. Note: The RODEON piXposer and piXpert are compatible with any WLAN (802.11b/g/n) device (smartphone, tablet, laptop, notebook, or PC) running any operating system (Windows, Mac OS X, Chromium OS, Unix, Linux, Android, iOS, Windows Mobile, Blackberry, etc.) with any internet browser (IE, Firefox, Chrome, Safari, Opera, etc).